After Municipal District of Taber council voted to apply for water rights on 18 quarter sections from Bow River Irrigation District at a special meeting last month, they received correspondence back on which were successful. During council’s regular meeting on Jan. 29, they had a chance to re-engage in discussion on how they wanted to proceed. Of the 18 quarter sections of M.D. owned land, 14 were successful while four were not accepted due to capacity restrictions and of the 14 successful parcels, six would be available for inclusion in the district. “A week ago we submitted our application for 18 quarters of irrigation on M.D. owned lands. On the letter received, it states we were successful in getting six quarters, which is what folks with multiple quarter applications received the maximum amount. There were four deemed to be rejected just by virtue of not being able to service them with water because of their location and capacity of their ditches that supply that area. That left 14 left to choose from and carry forward with. We made some calls again to leaseholders to see which ones were more interested than others and I think we narrowed it down to five definitely, and probably six, that we could move forward with,” explained Brian Peers, director of municipal lands and leases. If council were wanting to move forward with the conversion to irrigation, there would be a few steps needed. “The next step, if council deems it to be something they want to do, is to get soil testing done on the quarters that were most interested. Maybe we should do a few more rather than just the six we are hoping to do because if some seem to be more suitable and flat topography, it could be useful to have that information. I’m suggesting up to 10 quarters, there would be some questions on whether or not it is worthwhile but I think we can pick 10,” said Peers. In terms of price for the soil tests, there was no hard number though administration did some digging on the price range. “From the estimates received from a couple different contractors, the prices came in around $3,000 to $3,500 but some of these quarters there is existing information already. They have limited information, they would just have to do an update that might cost $1,000 to $1,500 to complete. I think it is time and money quite well spent,” stated Peers. According to Peers, soil tests would take roughly a month to complete. Council had questions on where the approved 14 were located and if they made sense to convert. “There is a bit of a cluster of three or four in one spot, another with two quarters that we can run one mainline to and one individual one right off the canal. It does make sense and there is opportunities to work with some folks out there that are looking to do something similar in the same area. We can share costs with the mainline and pumping and electrical insulations with Fortis, too. We will certainly look at every angle to make it as cheap as possible,” continued Peers. If council was in favour of moving forward with the soil test, amendments would be needed to the 2019 budget. Even though the project isn’t listed in the budget currently, council could make that amendment. “We would have to get a council resolution to add this to our 2019 budget as we do not have a budget for this type of expenditure. I would suggest these costs as well as irrigation development costs from the sum total of the cost for the project in terms of borrowing. We would also need a resolution to amend our 2019 budget to permit these expenditures,” explained CAO Derrick Krizsan. With the BRID letter dated January 25, 2019, the M.D. 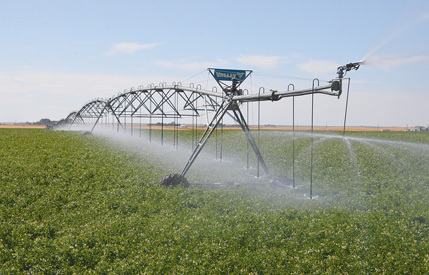 has six weeks to submit a deposit of $100 per acre for each irrigation acre they want to purchase. The deposits would be non-refundable, though a failed soil test would be refundable as it would be a circumstance that is beyond their control. With six weeks until the payment was due, council still had a few questions based on the new information received. “I have a few questions and concerns in regard to this. One being, if we are only approved for six, how do we pick and choose the land we are going to use and would it be looked at as favouritism going to only certain ratepayers depending on where the quarter lands are and not the other ones we could use? The way I see it, before going any further with spending money on soil testing and such, I feel we should get a lease agreement that would be agreeable by all parties first. I would be reluctant to spend any money before we even have an agreement in place with the leaseholders as is,” stated Coun. Leavitt Howg. As far as deciding on the six available parcels, Peers stated there wouldn’t be a big challenge as only five or six parties have expressed interest. “From the conversations I had yesterday, there is not more people asking for water than what we received. It may even be only five that are interested so we don’t have to exclude anybody that wants it,” he explained. Speaking about lease agreements, Peers was confident something could be worked out fairly quickly. “I do have some pretty good agreements with agencies that could do something very similar. It wouldn’t take long to put together and yesterday in conversation with those folks, I did talk briefly about what we were expecting for rents because that way we could determine if they were interested or not. The majority of them said that was in the realm of what they would expect to pay for renting irrigated lands. Some of the numbers I threw out if they were to put out the pivot, it would be around $200 an acre and if we were to do the entire system, it would be around $250 per acre. They didn’t balk at that really at all,” he said. With council expressing the need for more information before proceeding, they wanted to bring the discussion back to council. While bringing it to the Ag Service board meeting on Jan. 4, Coun. Jen Crowson suggested moving it to the regular council meeting on Feb.1 instead as it would allow Peers an extra week to work out the details. A motion was made to gather further information and bring back to council during their Feb. 11 meeting and was passed unanimously.